This bundle supports doctrine style fixtures. To create one you will need to add a php class in your bundle's /DataFixtures/Mongo directory. For Example src/AppBundle/DataFixtures/Mongo/LoadTaskDataFixture.php. Note: This class must implement at least the MongoFixtureInterface, if you need container support you can extend AbstractContainerAwareFixture to use the getContainer method. Since 0.6.6 it's possibile to specify the order by which the fixtures are loaded. Make sure it implements OrderedFixtureInterface. Fixtures with lower values of getOrder will be loaded first. mongodb:database:drop: To drop a database. mongodb:collection:drop: To drop a collection. 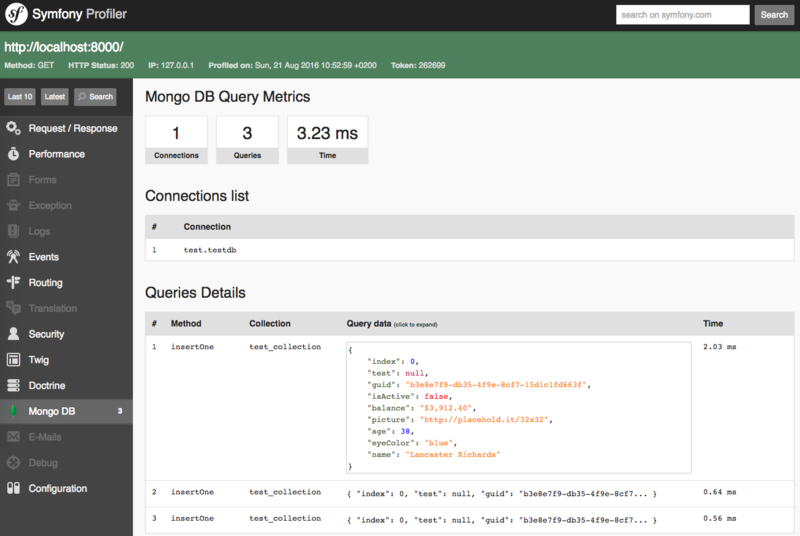 mongodb:fixtures:load: To load the fixtures. On dev environment all queries executed by the library MongoDB\Collection class are profiled and showed inside the symfony web profiler. Feel free to contribute by opening a pull request. Bug fixes or feature suggestions are always welcome. If you like docker there are some scripts to setup an insulated development environment. Please be sure to have docker and docker-compose installed on your system. Note: All the above are meant to be used outside the containers. During the setup a docker-compose.override.yml file is created from the docker-compose.override.yml.dist template. Change the port binding configuration inside it to fit you needs.